A question was posed to me earlier this week. What is your source of joy? Well my answer is the Lord Jesus Christ is my source of Joy but my explanation of that answer may surprise you. I came to grips with who and what I was several years ago; I am a criminal, that’s right a criminal. Now to bring light to this subject of joy a separate question needs to be asked. What is value? For something to have value it must be valuable to someone. Nothing in itself has value unless someone is willing to pay for it. 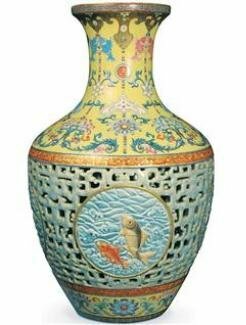 The Qianlong vase is an 18th century porcelain vase from the Qing Dynasty; The Qing Dynasty succeeded the Ming dynasty in 1736. The vase was sold at auction for a reported $80 million making it the world’s most expensive vase. Now I ask you, is the vase itself valuable or is the vase valuable because someone was willing to pay a lot of money for it? Is the vase pretty? Yes, but there are a lot of pretty vases. What makes this vase so special? This vase is special because it was special to someone, to the amount of $80 million. 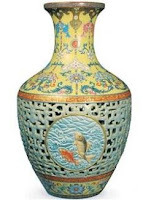 Is it worth that much to me, I should say not, in fact to me it has no value at all, I wouldn’t buy this vase, in fact if I saw it while out shopping in an antique store; not knowing it had value to someone else, I would pass it by not giving it a second glance. Now I told you earlier that I am a criminal. What do criminals deserve? Criminals deserve punishment for their crimes. The punishment I deserve for my crimes is death and eternal torment. You see the laws I’ve broken are not man’s laws but are the laws of God the creator of all things. This is not a light matter, God gave me life yet I defied Him who created me and did whatever I wanted to do. He asked that I love and worship Him and not other things yet I have worshiped the creation rather than the creator, He said “do not murder” the bible says “If you hate your brother you are a murder at heart” and I have hated several people during this life making me a murder at heart, He said “do not lie” yet I have lied countless times. And this is just three of God’s Holy Ten Commandments with seven others. God said “He will judge the world in righteousness” also “each of us shall give account of himself to God”. The bible says “it is appointed for men to die once, but after this the judgment”. I know who I am, I am a criminal, if I face God on judgment day and have to give an account for the things I’ve done in this life I will be found guilty and the punishment for my crimes is eternal punishment in Hell. I told you earlier nothing in itself has value unless someone finds it valuable. My joy in the Lord is this; God found me valuable to Him. In fact He found me to be more valuable than the Qianlong vase. How valuable am I to God? What is the price He was willing to pay for me? You see I have broken His laws and the punishment for that is death, but He loved me so much, He Himself paid the price for My Crimes. God sent Jesus Christ His only begotten son to pay the price for my crimes and anyone else who will believe and follow Him. Jesus said: “Most assuredly, I say to you, he who hears My word and believes in Him who sent Me has everlasting life, and shall not come into judgment, but has passed from death into life”. “I implore you on Christ behalf, be reconciled to God”. Jesus said: “The time is fulfilled, and the Kingdom of God is at hand, Repent and believe the Gospel”. This is how to be reconciled to God, Repent (turn away from sin and turn to God) and put all of your trust in Jesus Christ for salvation. If you do this you will be saved from the judgment of God and rejoice because God has found great value in you, He purchased your freedom from death and punishment with His own blood.